Well, that title may not be completely accurate, but it fits the post. 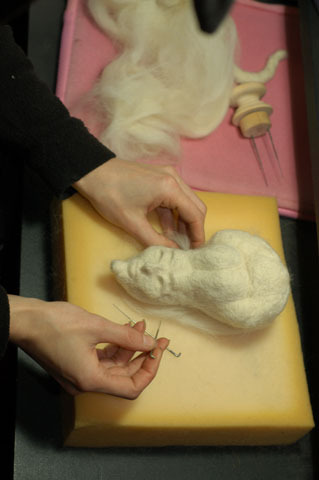 In mid-February I had the amazing chance to learn the art of needle felting from one of the medium’s most innovative and impressive artists, Stephanie Metz (http://stephaniemetz.com). I recently came across Metz’s work quite by accident, and was immediately impressed with her content and style. I had previously seen other needle felted animals and more primitive-looking felted objects before, but what Metz had done with the medium opened up a range of doors I didn’t think were possible. While perusing her site, I noted that she was teaching a needle felting workshop at my alma mater, CCA, so I jumped at the opportunity to learn this intriguing art form from this master fiber artist. The workshop was small; there were only 4 other students (all female) in the class, which kept it really friendly and gave it a “Felting Bee” type atmosphere. The participants were all already artists and sculptors, so that lent itself to some really impressive and spectacular first-time projects. Stephanie was very easy to listen to and incredibly open, answering all the questions people had for her with great honesty and candor. She showed slides of other fiber artists as well as her own art, and even brought some of her pieces to show to people, including one of her “Overbred” creatures, an abstract piece, a teddy bear skull, and some teddy embryos in jars. The work is even more impressive in person, and after learning the basics of the medium, doubly so! She even let the students touch and hold her work, which helped us get a sense of the density and texture of what a finished piece should look like. I am really excited about where I will go in the future with this new skill under my belt, and will be trying to do as much as my BCT (Burgeoning Carpal Tendonitis) will allow for. (Who’d have thought stabbing hair into shapes would be so labor intensive?) I’m looking forward to combining my more cartoony antigurumis with some more realistic, sculptural needle felting and taking my fiber art to another level. Here are some pictures of me in action, working on my current (grandiose) first project — I will hopefully be updating as the work progresses. This entry was posted on February 28, 2011 by croshame. It was filed under Croshame, Needle Felting .